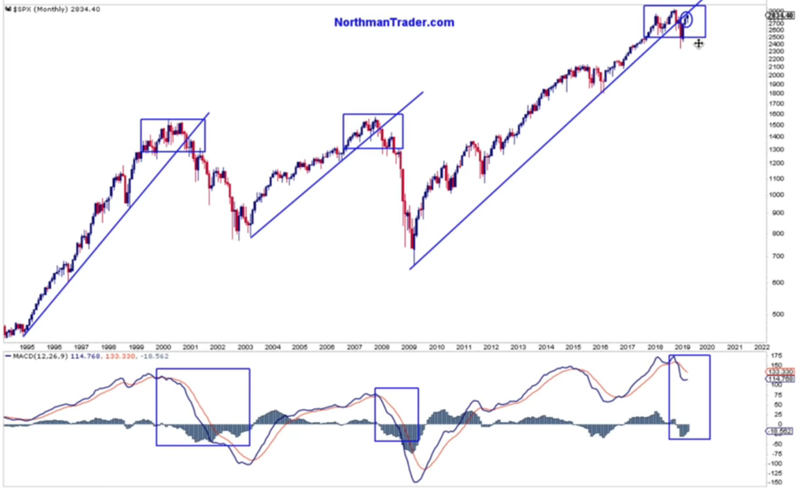 His weekly flurry of trendline charts warn that the major indexes have been compressing in rising wedges that increasingly point to a binary outcome: either a massive new leg up that will result in the market making new all time highs, or a bad breakdown that could waterfall into a 2008-style correction. Passive investing obviously is becoming a larger portion of the investing mix to the point where we have more ETFs investing than we actually have stock traders. And so there’s this element of automatic allocations. A lot of these are driven by market cap weightings, for example. So to the extent that you have a lot of influence coming in from passive funds or ETFs, they will buy a certain set of stocks more actively than others, because it’s just the way it’s allocated. We saw that last summer -- and this is one of the things want to pay attention to, when you see divergences and deviations. In September of last year, I wrote a piece called “Lying Highs" in which I pointed out that we were seeing ever-narrowing slope of the rally, driven by fewer and fewer stocks. It’s kind of one of those classic 'popping' signs, but the problem with it is it doesn’t give you precise timing. This stuff can drag on, and on, and on. We saw that throughout all last summer. So these passive investing vehicles come in and keep buying high cap tech stocks —remember, this drove Apple to $1 trillion dollars market cap, Amazon to $1 trillion dollars, and analysts kept raising their price targets. And so money keeps flowing in and stock prices go higher. It attracts more money, and that attracts more money, and that attracts more money. It becomes this pyramid scheme -- until something breaks. And that’s what we saw in the fall. The rally was just too thin leading up to that, and then required the technical downside reaction. That’s the danger of it. I like to say "Just because they’re buying doesn’t necessarily mean that they know what they’re doing." Because these momentum moves just defy reason. You got to be able to shut off your brain and understand what’s driving this. It’s not fundamentals, necessarily. It’s basically just the flow of money at the end of the day. And the algorithms buy it. So be aware of the structure of the market. Now, I’ve been very critical of how this rally has formed so far this year. One of the lessons I drew out of 2018 was this simple message: Extremes will become more extreme. And that’s the biggest danger for traders, because you can easily get chopped up. And when things get so extreme, you've got to be very careful in not losing sight of the big picture and be patient and wait for the right setup. The fact that we’re here now 10 years after the GFC and the Fed tried for only three brief months in 2018 to be non-accommodative. Jay Powell dropped the "accommodative" just in the September/October time frame, and it blew up in their faces. And the ECB is still sitting with negative rates -- they ended QE at the end of December and European growth is maybe 1%, and Germany looks around 0.6%. We’ve never been in an environment where we are risking entering a recession with negative rates. We have no idea what that means. And so the concern is that this past decade's wave of cheap money will be our undoing. Since 2007 global debt has increased by $70 trillion. We've now got corporate debt at $6 trillion. And at the same time, when you look at real GDP growth, it just never kicked into high gear. If you go back to the last 30 years, and you can look at the Fed funds rate, you can look at the TNX 10-year, and you can look at real GDP growth. It’s the story of lower highs all around. And it’s all sustained by massive, massive debt. And so now that we’ve tried it for 10 years, and the Fed recently admitted that they’re done and that they can’t do anymore. It's highly concerning. Because how do you sustain an economy that can’t even handle a 2.5% Fed funds rate? The economy is dealing with two major issues. One is obviously demographics. There’s an aging wave that's just not changeable, and it’s got implications. We have huge unfunded liabilities. We’ve got a whole replacement cycle going on that's not conducive of productivity. And then on top of that, we have the greatest deflationary force the planet has ever seen—technology. Facebook, for example, does not need that many people to handle over a billion customers. So there’s this deflationary force that’s built into the economy that’s preventing from proper growth taking place as well. At the same time, you’ve got all these debt issues that are not being resolved. They act like a dual brake on the economy, and they can’t solve it. And it seems we have no political structure anywhere globally at the moment that’s able to address structural issues in any shape or form. I don’t see it in the US. I don’t see it in Europe. Take Brexit as an example; it’s total chaos. There’s no way to come to a cohesive solution on anything. How do you fix the structural issues in the economies if you don’t have any type of political cohesion taking place? There’s really no way out of that. Click the play button below to listen to Chris' interview with Sven Henrich (50m:04s). Chris Martenson: Welcome, everyone, to this Featured Voices podcast. I’m your host, Chris Martenson, and it is March 26, 2019. As you know, it is my view that the financial markets have become so deformed from increasingly obvious interventions by the central banks that these markets now deserve not one, but two sets of quote marks around them. So “markets.” Some of these interventions are quite obvious, and everybody agrees on them because they have no choice, right? That the central banks, they dropped interest rates to below market clearing levels. That spiked the prices of stocks, bonds, and of course real estate. Trotting out central bankers on a now almost daily basis to talk the markets higher is such a common event that I’ve given up even pointing out when it happens, let alone commenting on their words further. As a seasoned watcher of the daily or intraday tape, I’m convinced beyond a shadow of a doubt that somebody—call it the TTP, the central banks directly, their proxy agents at Citadel, or some combination—is routinely intervening in these markets via volatility suppression during—via something called the V-I-X, or VIX, as well as futures. Now, why would they do this? Well, because it’s a means of having the market send out the right signals so that ordinary folks won’t get spooked and carry on borrowing and spending maybe more than they can or should. So to share his insights into these markets today, and hopefully to tell me that they are actually free and fair and that I’m needlessly jaded, is Sven Henrich, who I am delighted to finally have on the program. Sven’s insights can be found at NorthmanTrader.com and on Twitter using the handle @NorthmanTrader. Sven Henrich is founder and the lead market strategist from Northman Trader. He’s been a frequent contributor to CNBC, the Wall Street Journal’s MarketWatch, as well as known for his diligent technical directional and macro analysis of global equity markets, sometimes sarcastically delivered, but always really accurate and timely. He publishes the Daily Market Brief, keeping investors and traders abreast of the latest market critical developments and outlook. And he publishes technical and live updates on his private Twitter feed, which I follow like a hawk. Sven, welcome to the program. Sven Henrich: Hi, Chris. Glad to be with you. Chris Martenson: Sven, tell us about your market experience, how you—excuse me. Tell us about your market experience and how you prefer to approach analysis, and making trading decisions, things like that. Sven Henrich: Well, we look at a number of—first of all, let me say we’re basically technical analysts, me and my wife. She’s a system premier swing chartist, and obviously I focus on charts a lot as well, and we use a lot of different indicators. But we also like to keep it simple at the same time. We’re not day traders. We’re focused more on like larger moves to the extent that we can, and we try to position full turns, so be it long or on the short side. So that’s basically our main task. And at the same time, obviously we’re very cognizant of outside influences on markets, market developments, be it news, be it central banks, be it the economy, what have you. And so we keep a close tap on that and that’s what you’ll find we write about a lot on Twitter, on my website. Chris Martenson: So you heard it in my intro, Sven. I’m basically a card carrying manipulation theorist. I ascribe a lot of what I’ve seen in these markets over the past 10 years really now to interventions at times rather than legitimate investment decisions, especially at key technical levels, and double especially in the thin overnight future sessions when things are pretty easy to whip around. Those are my views. What are your views on market structure and how things operate these days? Sven Henrich: Well, first of all, just the aspect of liquidity. We actually, over the last few years, have seen liquidity dry up quite a bit, and to your point, that allows low volume environments to be conducive of this permanent drift up that we’ve seen. The lower the volume, the more steady the drift. Last summer was s good example. Volatility completely died. 2017 was the same way. Very difficult trading environments, because you basically are now staring at a tape that doesn’t move intraday. We’ve even seen some of that this year so far. You just see this two, three handle intraday ranges, and a lot of the action comes via gap ups, “magical gap ups” I call them. In fact, earlier this year we had this—after making fun of this on Twitter—if you can find an edge that way, that’s great too. But we have—every Friday we had basically a risk-free Friday. There either can be gap ups or we missed there with a gap down. They magically closed every Friday, which is quite amazing to see. Because that’s not typically how you would view a market environment where a particular day of the week always turns out the same way. There’s a little back and forth. Now, understanding the mechanics behind that is critical to understand, because obviously we need to understand what drives these markets. Now, we can’t change what drive these markets, but we need to understand what drives these markets. And so you need to understand who’s active, what they’re doing, what the influences are. And of course, we had the influences of news items, be it president tweets, or said speakers, what have you, and you can see what the machines are reacting to. Because a lot of the stuff is not fundamental-based at all. It’s basically just the news toll and the machines are programmed a certain way, they go a certain way. What we want to understand obviously, what are the pivot clients, what are the clients of resistance, and what are the specific indicators that tell us, OK, now we can expect a turn either way. That’s what we’re looking for. As much as the environment may frustrate you, or me, or anyone else, that has to be our task, to kind of drawl value from these markets. So you got to find where the algos live and you got to figure out exactly what they pivot off. Because at the end of the day, they’re just programmed as well. So it’s a constant back and forth understanding the technicals, the macro structure, and what influences it. Know where you’re wrong as well, obviously, with stuff. Chris Martenson: Absolutely. So a couple of good ideas in there. Let me start with this one. Let’s talk a little bit more about this idea that there really aren’t investors anymore in the sense that the markets are so dominated by computer algorithms that those really are now the markets. They’re programmed, and we’re seeing some obvious weird effects from that, and it’s just good to know about this. So I’ve been trying to educate my audience on the market structure. So take us back. You remember Apple had some slightly disappointing earnings just a little while ago, and later on, almost within minutes, we saw the New Zealand currency plummet as a response to something that happened to Apple. And my explanation for that is, these are global markets. There are these algorithms that are running all sorts of complicated pair trades. They have their reasons, they have their rationale. But for somebody who cut their teeth on the markets 20 years ago, I would never have predicted that Apple’s earnings disappointment would have led to a crash of the New Zealand dollar relative to the Japanese Yen. Do you have a—is that sort of a reasonable way to put a spotlight on the idea of how intertwined these markets and how computer-driven they are? Sven Henrich: Yeah. Look, it’s not like the price is necessarily determined by millions of individual traders sitting in front of a computer and pressing buy or sell orders. No, not at all. Actors, actually passive investing obviously is becoming a larger portion of the investing and adverse you have, more ETFs than you actually have stock traders to invest. And so there’s this element of automate allocations, and a lot of these are driven by market cap weightings, for example. So to the extent that you have a lot of influence coming in from passive funds or ETFs, they will buy a certain set of stocks more actively than others, because it’s just the way it’s allocated. We saw that last summer, for example, and this is one of the things you also want to obviously pay attention to when you see divergences and deviations. I happened, in September of last year, to have written this piece called “Lying Highs.” And I kept pointing out that we saw ever narrowing slope of this rallying figure with fewer and fewer stocks. It’s kind of one of those classic popping signs, but the problem with that is it doesn’t give you precise timing. This stuff can drag on, and on, and on. We saw that throughout last summer. So when these folks come in and they keep buying high cap tech stocks, then all of a sudden, you have all—remember, this went back to Apple, trillion dollars, Amazon, trillion dollars, and analysts kept raising their price targets. And so money keeps flowing in, stock prices go higher. It attracts more money, and it attracts more money, it attracts more money. It becomes kind of this pyramid scheme until something breaks. And that’s what we saw in the fall, and it was just too thin prior to that, and then required the technical reaction. That’s the danger of it. So just because—I like to say, just because they’re buying doesn’t necessarily mean that they know what they’re doing. Because these momentum moves, and that’s basically what you have, they just defy reason. You got to be able to shut off your brain and understand what’s driving this. It’s not fundamentals necessarily. It’s basically just the flow of money at the end of the day, and programs buy it. So be aware of the structure of the market. Chris Martenson: So let’s talk about something you just brought up a few points ago, which was about risk-free Friday. That came to a crashing end last week. Here we are again. As a reminder, this is March 26. It’s Tuesday. Just a few days ago we saw a pretty big tumble on Friday, but nothing but bright green roses every since. How do you make sense of that? How does that fit with what you’ve been seeing? Is that a change? Sven Henrich: Well, not really at all. I looked at—I’ve been very critical of how this rally has formed so far this year. From the December lows, it made perfect sense. We had massive disconnects, and deviations, and oversold readings. We had some of the most oversold readings since 2009. It was quite impressive. And that’s why I kept pushing, and there’s going to be a very sizable rally. It reminded me a lot of the 2000, 2001 transition, because we had a high. We had a wide price range, multiple corrections, and then we had—that was really fascinating. Because we had for the first time since 2000, we had a new yearly low in December. Remember, in September, October, everyone was going about how Q4 is guaranteed to be a winner. And it’s extremely rare to see a new yearly low in December, but that’s what happened in December. But technically, it demanded a reconnect. But that was the case I was making, we should see moves to the 50 to the 100, and May, and all that. It just kind of rebalances everything. That made sense to me. But what started the really disconnecting was obviously this incredible flip-flop by the Fed and the timing of such, and how it was driven ever since, and we can talk about this a little bit more about the Fed. But basically what we saw then is this entire rally take on a life of its own and in certain industries. Because even though on Friday things disconnected, they have disconnected prior to Friday, specifically the small caps, transports, and the banks even. Obviously, the banks got hit on Friday because of the yield curve inversion, but they were already signaling weakness ahead of time. And the trigger for me on Friday was simply the fact that the Fed caved completely. Just prior to Friday, it was always kind of a word game—yes, we’re going to be flexible on the balance sheet. And yes, maybe we’ll hold off and be patient on rate hikes. But on Friday, they cemented it. They pulled away the carrot basically. With a China trade deal, you always have a carrot in front of you. But once they made it very clear that they’re not going to roll off the—that they’re going to end the roll off of the balance sheet in September and they’re going to fully stop rate hikes in 2019, maybe have one in 2020, that was the Feds going fully dovish. And at that point, once the carrot’s removed, it’s priced in. And obviously, with the collapse in yields that are created at the same time in the inversion, that caused that initial plunge. And it was a sizable plunge. And then we had small caps go down 3.5%. And what you’ve got to realize is that you will get short-term oversold readings. And these oversold readings, they will end like bounces. Not just because an event happens. The market structure hasn’t changed. The algos are still programmed to buy, and as soon as you get some relief on yields, like you did today, then it makes sense to see another counter rally to that. Chris Martenson: With a computer, it’s—their famous psychology. They don’t care, right? They’re just programmed for certain things. So if they see oversold or whatever strategy they’re pursuing, they will follow that. In many cases, I think they’re just liquidity gauges, right? If there’s money there, they’ll chase it. Sven Henrich: Well, I tell you what. One of the lessons I drew out of 2018 was—and it’s about $420 reading in 2019. It’s a simple message, but it’s a really challenging one is that simply that the extremes will become more extreme. And that’s the biggest danger for traders, because you get chopped up. And when things get so extreme, you just want to—what’s going on here? And you got to be very careful in not losing sight of the big picture and be patient and wait for the right setup. Yeah, but the Fed capitulating on Friday was something else. And I’ll tell you why. Because having watched central banks so long, and I’ve been a critic of central banks for a long time simply because I do have some macro concerns of what they’ve done, not only to the market structure, but in terms of how the entire economy is playing out as a result of them. Maybe just go back here in time a little bit. If we go back to 2008, 2009, the premise of the entire intervention game was for it to be temporary—QE1, bail out the banks, all that good stuff. And that made sense. The global economy was literally hours away from a major collapse, so I fully understand that they had to go in and rescue the hell out of it—totally made sense. But then of course what we’ve seen over the last 10 years is that one intervention led to another, and another, and another. And the promise of this being temporary obviously is long gone. And the question that people like myself have been asking, how are you going to ever get yourself out of that? And the promise was always, well, we’re ready to normalize. We’re going to reduce the balance sheet. We’re going to raise rates, because all this fantastic economic growth is going to take place. Well, it hasn’t. But the fact that we’re here now 10 years after the fact, the Feds tried for three months in 2018 to be non-accommodative. Jay Powell dropped the accommodative just literally in the September, October time frame, and it blew up in their faces. And the ECB is still sitting with negative rates. They ended QE at the end of December and European growth is maybe 1% and Germany looks around 0.6%. We’ve never been in an environment where we are entering or risking entering a recession with negative rates. We have no idea what that means. And so the concern is that this wave of cheap money—and this is kind of the story from 2007, except on steroids now, because global debt has increased by $70 trillion. We got corporate debt at $6 trillion. And at the same time, when you look at real GDP growth, it’s just never kicked into high gear. If you go back to the last 30 years, and you can look at the fed funds rate, you can look at TNX 10-year, and you can look at real GDP growth, it’s the story of lower highs all around. And it’s all sustained by massive, massive debt. And so now that we’ve tried it for 10 years, and the Fed on Friday admitting that they’re done and that they can’t do anymore, is highly concerning. Because how do you sustain the economy that can’t even handle 2.5% _____(00:18:14)? Chris Martenson: I totally agree, Sven. I’ve been a huge critic going all the way back to Greenspan. And it’s frustrating to still be the critic this far down the road, because I thought we had chances to learn along the way. And my primary criticism is this: I think the Fed has made just a colossal blunder by mistaking their interventions in order to prop up a credit cycle is a means of replacing the business cycle. It was hubris. It was conceit, but also the data doesn’t support it. What you get with a credit cycle, of course, is lots and lots of credit. It creates the appearance of activity, but not the reality of real economic growth and activity. So it’s just as fake as can be in this sense. And the way I explain this to people over dinner who don’t study economics, I say, listen. Imagine if both of you have $100,000 of income, and you each of a GDP therefore of $100,000. And you go out and work harder and you earn 10% more. Yours is growing an exciting, but modest 10%. This other person borrows $100,000 and spends it on a vacation and a boat. The way we measure things, that’s the more exciting economy. It grew by 100%. Credit is only good if it’s being applied to useful things, and much of the credit in a credit cycle gets put into dumb things. That’s just the nature of it. I don’t understand how they fail to understand this at the Fed. But boy, I think credit bubbles are terrible and they create a really bad hangover when they finally let go. Sven Henrich: Yeah, much of a Fed critic that I am, I also sympathize with them on one level. Sven Henrich: —that is just not changeable and it’s got implications. Obviously, we unfunded liabilities. We’ve got a whole replacement cycle going on that is not conducive of productivity. And then on top of that, we have the greatest deflationary force the planet has ever seen—technology. The fact that you have the biggest companies on the planet really, or the two with market cap, it being able to effectively manage millions and millions and millions, and in some cases, billions of customers, like Facebook. Facebook does not need that many people to handle millions and millions of customers. So there’s this deflationary force that’s built into the economy, and that’s preventing from proper growth taking place as well. At the same time, you’ve got all these debt issues that are not being resolved. So it’s like an actual break that’s on the economy and they can’t solve it. And maybe take this to a bigger part, we have no political structure anywhere globally at the moment it seems that it’s able to address structural issues in any shape or form. And since the banks are basically there to keep the boogeyman at bay. I don’t see it in the US. I don’t see it in Europe. Take Brexit as an example. It’s total chaos. There’s no way to come to a cohesive solution on anything. And how do you fix the structural issues in the economies if you don’t have any type of political cohesion taking place? And there’s really no way out of that. Chris Martenson: No, there isn’t. And Ben Hunt of Salient Partners wrote a great piece recently where he compared Jerome Powell to Arthur Burns, the former Fed chairman back under Nixon, who completely caved to political pressures back then. It looks to me that that’s not an unfair comparison. I think Jerome Powell has not just caved to the markets, I think he caved to political winds, gave Trump everything Trump could ever have wanted for really not good reasons, as far as I’m concerned. You said that Powell, the Fed, has caved. That’s perhaps not too strong a word, but worse perhaps in this line of thinking. Trump just nominated Stephen Moore to the Federal Reserve Board. For people listening, I’ll give you a link so you can get a sense of who Stephen Moore is. But in your own estimation, Sven, who is Stephen Moore? And what does he bring in terms of outlook qualifications, all that? And what—is Jerome Powell the Arthur Burns of our time? Sven Henrich: Well, Stephen Moore, I’ve seen a few interviews with him. I have not gathered a sense of any proper understanding of economics or markets. I can only refer to him as maybe a potential political hack. His positions change as administrations change. The problem with the Fed here right now is that basically the appearance is awful in terms of what happened. December 18th Trump came out with a tweet about “stop the 50 B’s,” basically demanding that the Fed stop the balance sheet roll off. And just literally a few weeks later, Jay Powell came out on January 4th and said he’s flexible with the balance sheet. And not only that, now in March he stopped it. So the timeline is very unfavorable, just the appearance. See, the Fed is supposed to be independent, right? Sven Henrich: But the Fed over the years has obviously become increasingly susceptible to market fluctuations. It used to be that the Fed would do what the Fed would do, even if it was uncomfortable to markets, but those days are long gone. And I think the bigger problem here is simply that there’s a big reality here. Markets and economies are totally intertwined now. And if you have a mass selloff that lasts longer than a few days, you’re going to see economic impact that’s negative. And maybe that’s the big unspoken truth. And that partially explains why we see certain Fed activity at certain times. Chris Martenson: Why is it that markets are now so intertwined? That didn’t used to be the case. They were the indicator of economic health. But you’re saying now they’re enmeshed with economic health. How did that happen? Sven Henrich: Well, for one thing it ties everything together—financial services lending, confidence. I’ll give you a perfect example. Why do you think December retail sales were terrible? Chris Martenson: Because the market fell. Sven Henrich: The markets were plunging. Sven Henrich: Why was confidence up in January? Because markets rallied higher. There’s a life like link there. And it’s all over consumer psychology. So if you have bad headlines, you’ve got plunging markets, obviously then people have 401(k)s or they have investments and that curbs spending very clearly. Chris Martenson: So if we look at—to turn now to tie this in and say, OK. So we’ve got these markets, a lot of computers driving them. They’re also enmeshed because we have a very financialized economy at this point in time—absolutely the case. So let’s look at where we really are in the economy for now. So Sven, it looks to me like a recession is not only coming but may be here. I’m looking at the slump in the Baltic Dry Index. We’ve got the Chinese PMI data. We’ve got German industrial production. You mentioned the German economy. It’s stall speed, but their EnPro looks really low. US housing data—all these, many more indicators seem to be flashing red lights. What are you thoughts here in terms of a recession watch? Sven Henrich: Well, there’s a—I’m always aware of the triggers for the upside. Be aware that obviously the slowdown here in Q1, take the December correction out of the picture for a moment, it’s not unusual to see a slowing slope in Q1. We’ve had it a number of years before and then we had a pickup again. Having said all that, the reality is that the extent of the slowdown is much deeper than anyone had anticipated at this point. I call it this morning “chasing reality,” because all the projections that were made in 2018 about how 2019 would turn out turned out to be completely wrong. And maybe there’s a new—maybe it’s the way I’m seeing this right now. It’s that even the version of the yield curve is now being dismissed. It’s kind of just temporary. It’s just a fluke. And I am wondering if people are going to be chasing reality furthermore into this year. Because if things were related to the government shutdown or if they were related to the December correction, then why are PMIs still dropping? Why are manufacturing numbers still dropping in March? And maybe we can explain some of this with global trade, but the reality is we are really long on the tooth here on the business cycle. And so I think there is a lot of hope right now, if there is a trade deal with China and maybe there’s a miraculous Brexit recovery, that all this turns around and recession fears go away. It’s possible. But there’s, obviously, the other possibility that the macro wheels have already turned so deep that it’s going to take—maybe it’s not even possible. The machine is already on it’s way. Already, I mentioned the 2000, 2001 example. And the reason why I liked that one, not only because it was the destruction of the highs and then the December lows, is because the Fed stopped its rate hike cycle at that time. And six months later, we were in a recession. It was much faster than anyone had anticipated. Remember, 2000 was already related to the tech bubble, as you may well remember. And that’s what 2018 was all about—tech can do no wrong. And we’ve had these massive devaluations. We had these massive disconnects, and then we had a big, fat correction. So there’s structurally some similarities here. And I hate to say, well, you can compare one period to another. You really can’t. I’m just noticing some overall similarities. It may well be that a China deal will bring a lot of optimism back, but we haven’t seen a China deal yet. We haven’t seen any specifics of it yet. So it’s all basically psychology at this point and not a lot of substance to go on. Chris Martenson: Well, the good news is the potential of a China trade deal has been, I don’t know, maybe used 20 times to rally the markets. The president’s tweets are famous for that. Help me understand, help our listeners understand this. How much of a drag on the markets is a lack of a deal with China actually in terms of numbers? Do we have a sense of just how much things are really truly being held back? Or is it really just a question of psychology more than actual substance here? Sven Henrich: Well, I don’t see the market being held back by China other than on the yield front. Equities haven’t been held back. The stocks actually made an all new all-time high last week, and it mattered. Chris Martenson: Yeah. Well, it seems like the market rallies hard every time Trump says progress made, looks good, thumbs up, right? Sven Henrich: Well, it’s the anticipation of a deal. I think a lot of it is probably, like I said, that it’s the concern that are you going to get the classic tilt in this event. We may all get a big pop on the China announcement. It’s very, very possible. I have no insight into when we’re going to get something. Frankly, I’m maybe on a sidetrack here, but I’m not sure. If I were the Chinese, why would they accept a deal that’s not in their interest? So they have different election cycles than we do, right? And we have another US election next year. Maybe it’s in their favor to wait this thing out. I have no idea. It’s completely speculative. But I’m surprised you haven’t gotten a deal yet. Chris Martenson: Well, so yeah. This raises the other idea is that, if we look back at the sweep of things where really who is providing the stimulus and where it came from, I credit China with doing a lot of the heavy lifting of getting us out of that. Things were really falling apart late 2015, early 2016. We had all the emerging market troubles. We had the dollar spiking. We had bear markets breaking out everywhere. And then things magically turned around somewhere in early February of 2016. Looking back at the data, we see, OK, yes. The ECB was dumping a ton of money in the markets, but so was China. A really good piece of work that I follow closely out of Saxo Bank is their credit impulse model looking at China. It looks like their credit-driven economy has run out of steam. Are you tracking that at all? Sven Henrich: I have not. Obviously, I’m aware of the stimulus measures they’ve undertaken starting in January. Just maybe to your point about 2016. We had an earnings recessions there. And actually, the global economy was close to getting into a recession in 2016. And you know what happened, right? Sven Henrich: It was $5.5 trillion of global central bank that followed. And it was Janet Yellen, obviously, that halted the rate hike schedule in February. And that was after the banks had dropped 23% following the initial rate hike. So I think there’s a lot of scripting thought here that says maybe that’s what we’re repeating here vis-à-vis 2016. We have an earnings recession now. Central banks are turning dovish. But back then it took $5.5 trillion to really boost markets up, and I don’t see that type of intervention at this point at all. Chris Martenson: And is that because it’s politically not possible or the central banks are just not geared for that? They clearly will do whatever it takes and draw these terms. Because I’m curious. Because I think that that’s where I’m really leading with all of this. It feels a little bit like the market is anticipating that how it got rescued in 2016, we’ll do that again. I don’t think that can happen for a variety of reasons, but I’d be interested to hear yours. Sven Henrich: The ECB cannot do QE right now. That’s done. They’ve talked about the LTRO, bringing that maybe back in the summer, but that’s not a really major thing. So I think the ECB is trapped at this point. And here’s the other thing, and this is why I keep emphasizing this as well. Central bankers will never give people advance notice that a recession is coming. Sven Henrich: They are in the confidence game, because of exactly what I mentioned before—the inner links between economy and markets and confidence. You’ve got to keep confidence up. If Jay Powell went out and said there’s going to be a recession, we think there’s going to be a recession by December, that would have consequences. That would freak people out. That would cause selling. You can’t do that. So to that extent, central banking is always a political game and dragging right now, and ECB is in the same position. They are now proclaiming, yeah well, we didn’t see the slowdown coming. Yes, growth may be only half a percent, but don’t worry. There won’t be a recession. Come on, you can’t be serious. You can’t—if you didn’t see that amount of slowdown coming, you can’t predict there won’t be a recession, especially if your screening your projections this close to recession territory. So it’s an interesting time. I think the entire market construct is now dependent on the China deal coming through and maybe some sort of magic miracle. Without those two triggers, I don’t know what the carrot is right now, because the Feds just took the towel out of the game. Chris Martenson: So let’s talk about one of the upsides of the bullish case, of course, which has been the earnings per share growth say in the S&P 500. I interviewed Lance Roberts a few weeks back, and he pointed out, and we posted this chart, that while earnings per share, yes, it’s spiked a lot over the past five years. Earnings themselves have not. Those are dead flat over the five years, but the earnings per share is up principally because corporations, of course, loaded up on about $5 trillion of new debt, bought back about $5 trillion of their shares. That spiked earnings per share, because there are fewer shares outstanding to put the same amount of earnings against. So in other words, the bull case rests largely on this earnings explosion carrying on, but it seems unsustainable to me because it rests on two things. One, no recessions. Two, corporations have to borrow more and more and buy back more shares to retire in the future. What do you make of that overall dynamic of corporate earnings per share and how it’s been driven? Sven Henrich: Well, 2018 obviously EPS on a year to year comparison basis jumped dramatically, primarily tax cut driven. And to your point, we’ve had all these buybacks and these buybacks obviously reduce the flow of them so that you can actual have the same amount of earnings year after year. But to the extent that you reduce your flow, it looks like you have earnings to growth. That’s a favored game that’s being played. And obviously, right now in 2019, we’re on another record pace of buybacks, still courtesy of the tax cuts from last year. But the data that you mentioned by Lance, I actually put out a chart a couple of days ago that looked at corporate income over the last 10 years, 15 years and compared it to corporate debts. And speaking off the top of my head, it was Q3 2014 actually had slightly higher income on a corporate basis, but corporate debts since that time frame, just the last few years, has increased by a full trillion dollars. And if you go back even further to 2016, since 2000, excuse me, since 2006, Q3 2006 to now, corporate income has only increased by 17%, yet corporate debt has doubled instead. And that’s the inefficiency of what it takes to basically to keep the system moving. And that’s the big concern, obviously. Chris Martenson: And so how does—take us through that story. So corporations have obviously loaded up on a lot of debt. Listen, if I’m in the C suite, I’m understand the motivation. We’re all getting compensated based on how earnings per share grows and I can borrow at 1% and retire shares that are yielding 3% to make up a story. I can make a case for that. But beyond that, when I look at the overall loading up of debt, a lot of it triple B in nature on the corporate side and looking at all these buybacks, it feels like when a recession comes and there’s some sort of a reckoning, take us through that process. It feels like the corporations fare fairly exposed here. That’s how I see it. Bulls say, wait, they’ve got a lot of cash on the balance sheet. I say, well, they also have a lot of debt on the balance sheet. Have you got a sense of where we are in this story? Are corporations in better shape or worse shape than they might have been in say 2007? Sven Henrich: Well, it’s all a matter of debt sustainability, and as long as you have a very low rate environment, they can actually sustain it. That’s the argument that continues to be made. And that’s why rates actually start—if you look at the yields—they have stop and did stop in the fall. Actually, taking a side note here on the technical, the TNX—I have a chart on that—it’s fascinating. There’s a trend line that’s going back to the early 1980s. Every time we tie that trend line yields reverse, and that’s exactly what happened in September, October. Tied to trend line, that reversed it. Technically, actually what we’re seeing makes perfect sense. But now go back to the debt question. Yeah, if you are entering a recession, you are obviously—your cap position is going to change rather rapidly, because you still have your operating expenses, and you’re going to have to find a way to create efficiency. Part of the story on buybacks, obviously, corporations don’t have really any good investment opportunities. And Warren Buffet’s out there and he doesn’t know what to buy, because he doesn’t see any good buys out there. So you may as well turn them into buybacks. It’s a rather inefficient system, but it works for now. Chris Martenson: Sure, it works as long as things keep going. So really, honestly, this seems to a lot to hinge on where the central banks are, what they’re going to do. They capitulated. It turned out that the world couldn’t even handle a slight reduction in the Fed’s balance sheet even though it’s a global economy. And when you look at global central bank liquidity across say the big seven central banks, even though the Fed was reducing its balance sheet, that was the story. Oh my gosh, look. They’re unwinding their balance sheet. Looks impressive—many hundreds of billions rolled off. But overall, when you look at Japan, ECB, China included as well, nothing changed. There was still plenty of liquidity. But since December, according to the way I track these things, over $500 billion was chucked into the markets, or, well, into the system in response to that December bit. This looks like it’s all a central bank game. So do you think, Sven, that the ECB’s kind of out of ammo here, can’t do much politically? The Fed seems at best they’re going to hold pat. Who knows what Japan’s up to? They seem to be a little more activist than—who knows where they’re going. China also probably a little bit of probably a mystery here. How do we read all of this at this point in time going forward? What would you say is the summary of where the central banks are now? Sven Henrich: I think central banks are back to fully dovish. There won’t be no rate hikes in the foreseeable future. Markets are present in the rate cut. And I think actually this time around a rate cut would be bearish for markets, because certainly TNX, our line earlier, once that slip occurs typically markets follow. Now, they haven’t so far, and there’s this kind of—an interesting technical spot where we’re at. If you are of the view that this has been a bear market rally, then things could certainly lead to a retest or a new low. We haven’t seen the evidence for that yet. That’s why that kind of finding was interesting. I’ve been tracking it for a few months that showed that actually on the algorithmic basis the 2009 trend broke in December. There was a very steady trend line that actually connected with the 2016 lows, and that trend line was tested a few times in the fall, and then it finally broke in December. And what markets have done so far is move right back up to that trend line. Now, what I would have liked to have seen from a technical perspective is see a clear, clean rejection of that trend line. But what has happened instead with this constant job owning is we keep tagging that trend line on a daily basis and on a weekly basis. The trend line is rising, so it becomes more and more difficult for markets to catch it. But what one would want to see from a bearish perspective is see a clear rejection of that trend line. It hasn’t happened yet, and that’s why the market’s frustrated. So we got see how this plays out. Sven Henrich: But from that perspective, structurally, it is still possible this is going to be a market rally. Chris Martenson: And what are the key levels that you’re looking here, say, for the S&P, or NASDAQ, or any numbers you have at hand? Sven Henrich: Well, first of all, recognize that last week we actually got very close to the January 2018 highs. If markets can move above there I think you have to lift to open the door and do a retest of the old highs. So for example, a China deal or something like that. We saw just now a little bit below 2,800. That was saved obviously overnight. There is a lot of confluence support. If you look at the 27, 37, 27, 52 area. By confluence I mean there are a number of technical factors aligned. And this may be too deep here for the discussion, but I’ll just give you the five that I see. That’s already the 50ma, the 2 EMMA. There’s the _____ (00:43:22). We’ve got a _____ (00:43:24) led at 23, 6 set from that rally, and there’s an open gap. So you have five areas. To me, that says if we were to move down there, there’s very strong support there initially. Bears, unless they can drop to smaller and sustain below the 50mas, have nothing. I hate to say it. We’re in a sharp range when the wider price range of 2018, and until sellers can drop below that, it’s going to be tough slugging for them. Chris Martenson: Well, all right. Last question here is about the budget deficits in the US, pretty massive. I can’t believe that we have numbers that I’m seeing now. 10 years ago, 20 years ago, I wouldn’t have believed it, but here we are. Nobody seems too concerned about those in the financial media. I think you have a different view. What’s your thoughts on the US budget deficits here? Anything we need to be concerned with? Or there’s so much liquidity in the world, who cares? Sven Henrich: Well, by the way, keep in mind every time you see a big budget deficit number that means there is out of control overstatement of GDP numbers. Because deficit numbers, by definition, are counted as part of GDP. So on a $34 billion monthly deficit in February, part of your GDP number. So that in itself shows maybe how overstated Q1 may be. So actually, Q1 may becoming a little bit better than it was initially estimated, because we have all this debt filtering in. It’s all part of the equation. But the reality is that we are heading toward an environment where the interest on debt is going to be exceeding the national defense budget of the United States, which, as you know, is a massive program on its own. And with unfunded liability and ever more debts, and ever more interest payments, you’re going to get into a situation where you cannot fund your discretionary budget. US has a discretionary budget and a non-discretionary budget. The non-discretionaries—all the Medicare, Social Security, and all that stuff—a lot of that cannot be touched. And so it will curb a government’s ability to function, because it has to make cuts across the board. And that’s I think what we’re seeing from the administration. There was a proposal. They put in big tax cuts last year. Now they have massive deficits blowing up in their face, and they have to make cuts. Because the fundamental truth is tax cuts didn’t pay for themselves and deficits were not shrinking as a result of 3% to 4% growth. And here’s maybe my biggest concern on all of this. It’s not only the administration. It’s also the Congressional Budget Office. Everybody is working with financial projections that are assuming 3% GDP growth. I have not seen anyone come out with a recession summary, just even a stress test. And I used to be in corporate finance. And if you have any kind of forecast driven forecast, you always stress test against variables. If we have a trillion dollar deficit now before a recession, what is this going to look like in a recession? So I think, to your point, no political party seems to really care about it. It doesn’t seem to be on the agenda. I remember there used to be also fiscal conservatives. I don’t know what happened to them. There’s no one in the political leadership in Congress, or the Fed, or anyone that’s really speaking out against it. I heard Janet Yellen would say she was keeping her wage advice about the debt to GDP ratio, but nothing’s been done about it obviously. Chris Martenson: That was clearly after she left office. So, right? Sven Henrich: It was. It was. Chris Martenson: Nobody has those concerns when they’re in office. Sven Henrich: No, of course not. No, no, no. And by the way, what she did say in 2016, and I think everybody should pay attention to those statements as well because we heard some of that Fed speak on Monday this week. What are they going to do if there is a recession? And Janet Yellen did propose at the time, yes, it would be helpful for the Fed to be able to buy stocks directly. Sven Henrich: So, it’s coming. Chris Martenson: It’s unfair that the Swiss National Bank in Japan are having all that fun without us. And one of the pieces I point out, which I still—there’s a lot of smoke here, no fire yet. But the Chicago Mercantile Exchange, the CME actually has a central bank preferred buyers program. It’s right on their website. They say, listen. You guys are such heavy buyers of our products that we’re going to give you our preferred buyer program. So they have the best volume discounts. That means central banks are buying stuff on the CME. What’s traded there? Well, you know, futures and options on things like—it could be bonds. But there’s also equities, and commodities, and other things. So here’s the fun part. I know that the buying program exists. I’ve scoured every central bank website in the world, and none of them will admit to having any CME products on their books. And I’m just curious. I would love to know what they’re buying and when, and I think that would be pretty interesting information to have at some point. Love to know. Sven Henrich: But the most amazing central bank on the planet is the SNB in Switzerland. They print their own money and they buy Apple and Google. They can buy up without paying for it. So it’s amazing, printing money and buying stocks. That’s good. Chris Martenson: It’s good work if you can get it. I’ve been trying to do that for years, but the Secret Service doesn’t seem to like it when I do that. So I don’t know. Sven Henrich: But don’t worry. They are no market distortions whatsoever. Chris Martenson: No, don’t worry. Don’t worry about any of that stuff. Well, hey, and we are out of time here too. And we’ve been talking with Sven Henrich. He’s the founder, lead market strategist at NorthmanTrader. You can find excellent commentary at NorthmanTrader.com. Also, on Twitter @NorthmanTrader, all one word, @NorthmanTrader is the handle there. Sven, any other way people can or should follow you? Sven Henrich: That Twitter is the most prominent place. That’s where I hang out most of the time, get the most interaction. But obviously, on the website and you can also follow the public email link that’s on the website. But Twitter is usually a good place to find me. Chris Martenson: Excellent. Well, thank you so much for your interview time today and for all the work you put out on Twitter, because that’s a great way to follow you there. So thank you for both accounts. Sven Henrich: Thanks, Chris. I very much enjoyed the time with you. I loved talking with Sven! Great finally having Sven on the program finally. The LYFT IPO has been great for the people selling into the initial excitement, but not so great for the people buying on the opening two days. Of course, the company itself makes no money, burns cash, and has a business model with few barriers...turns out driving people around in their private car is something a lot of people can and will do for money. Balance sheet's a mess. Lots of debt. On and on. But really no different from many other companies out there currently flying high on the latest wave of central bank largess. I saw a news story that said when Anne Hathaway was nominated for awards Berkshire Hathway stocks went up. This suggests to me that algorythims are scanning the news and applying value, signals to the stock market. Question, if the news were not so censored and real news was reported doesnt it stand to reason that the stock market would perhaps go into convulsions? Just wondering? As Chris said at the beginning of the interview...""markets"". If there are no real markets, and the whole thing is basically a ponsi scheme of money printing, do fundamentals matter?? The whole thing is all resting on fiat, "faith". So maybe the only thing that matters is maintaining the perception of global dominance. Of course, with our globalized economy, all of the major players are fully invested in maintaining the status quo. As the last vestiges of "fundamentals" collapse they get monetized and turned into zombie markets. The only thing that matters is the "full faith and credit" of the dollar. As to the debt; An interesting feature of the Basel 3 accord is the new asset accounting system that has been devised with the intention of allowing interest rates to go down to NEGATIVE 8. This is openly admitted and you can find this in the wikipedia discription of BASEL 3 taken from direct quotes with sources. Now, we all know that positive interest grows the debt exponentially.....wouldnt negative debt SHRINK the debt exponentially?? And could this be the plan? A negative debt allows the debt to cannibalize itself over time. Maybe this is far fetched but it strikes me as a possibility that nobody has really caught on to yet. Once they've bought them, they get voting rights. As significant shareholders they influence corporate actions.